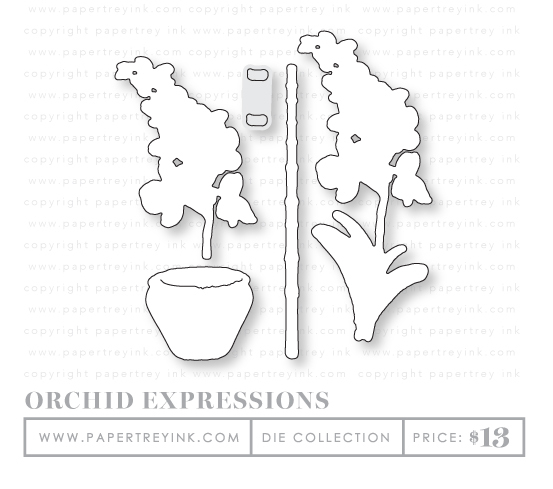 Give your projects an elegant, exotic look with the Orchid Expressions set. Expressive, and a bit abstract, the orchids in this set were adapted from original watercolor artwork and will give a hand-painted feel to all of your projects. The layered blooms come to life when stamped with your favorite ink colors. The orchid bloom can be combined with the pot included in the set, or used with the shorter stem to create borders, clusters, and accents. The font chosen for the sentiments is the perfect complement to the style of the flowers included in this set, and gives the perfect finishing touch for projects for many different occasions. STAMP DETAILS: This set comes on a single 4×8 acetate sheet. The assembled orchid including the pot measures 2” wide and 4-3/4” high. The pot alone measures 1-1/2” wide and 1-1/4” high. The bamboo pole measures 1/8” wide and 4” high. The orchid bloom with the shorter stem measures 1-1/2” wide and 2-7/8” high. The “thinking of you” sentiment measures 1” wide and 5/8” high. The “thank you” sentiment measures 1” wide and 7/8” high. The “happy birthday” sentiment measures 1-1/2” wide and 7/8” high. The “enjoy” sentiment measures 1” wide and 7/8” high. 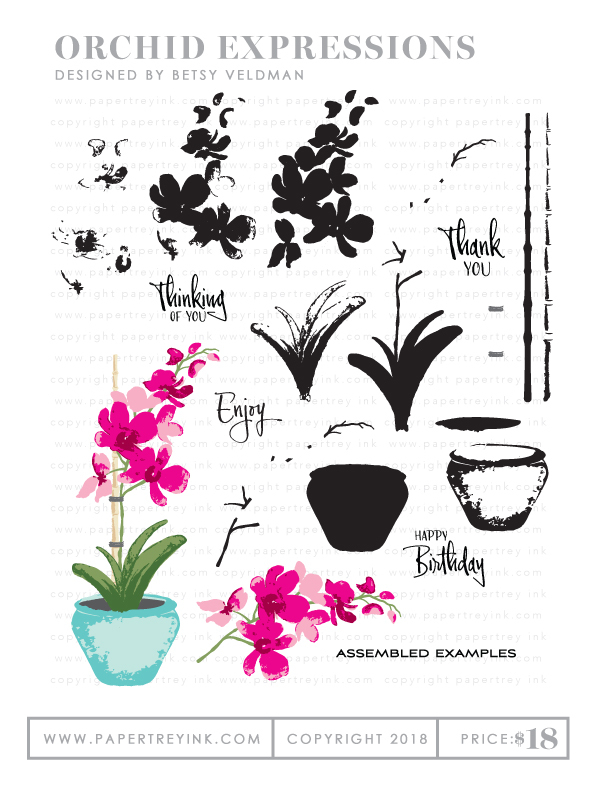 The Orchid Expressions dies are designed to coordinate with the Orchid Expressions stamp set. The pot cuts a slit so that stems can be tucked into the pot for realistic layering. DIE DETAILS: Contains a total of 5 dies. You’re an inspiration! The Words to Live By series highlights a different word each month, focusing on a positive quality or outlook on life. This set features the word “inspire”, along with several accompanying sentiments. It’s perfect for creating cards of encouragement, gratitude, teacher thank you cards, graduation cards, and more. STAMP DETAILS: This set comes on a single 3×4 acetate sheet. The word “inspire” measures 2-1/8” wide and 3/4” high. The assembled sentiments measure as follows — the “Being inspired is great…” sentiment measures 2-1/2” wide and 1-3/8” high. The “Aspire to inspire” sentiment measures 2-3/8” wide and 1-5/8” high. The “I hope you know…” sentiment measures 2-1/2” wide and 1-1/2” high. 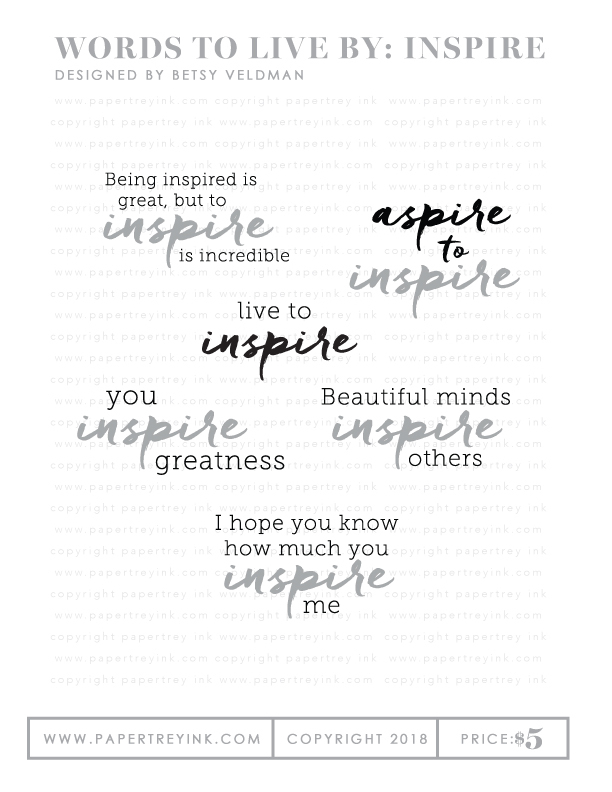 The Words to Live By: Inspire die is designed to coordinate with the Words to Live By: Inspire stamp set. Combine the die cut words with the phases in the stamp set for more layering and design options. DIE DETAILS: Contains a total of 1 die. 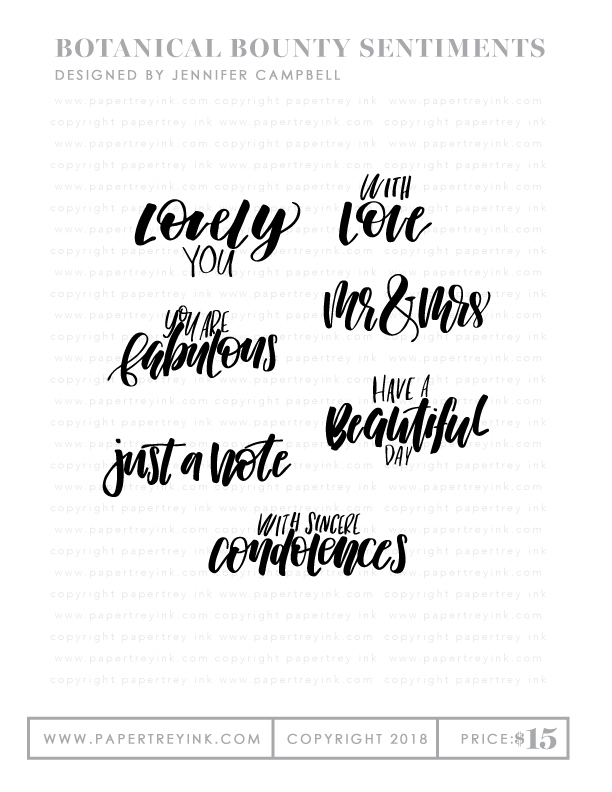 This hand-lettered sentiment set is perfect for that trendy, personalized look. The brush-lettering in this set compliments the watercolor florals from the Botanical Bounty I & II stamp sets perfectly! 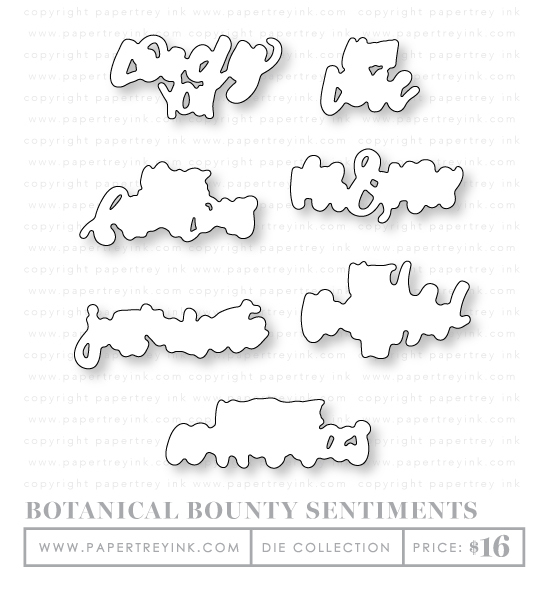 The Botanical Bounty Sentiments die collection coordinates with the sentiments in the Botanical Bounty Sentiments stamp set. DIE DETAILS: Contains a total of 7 dies. 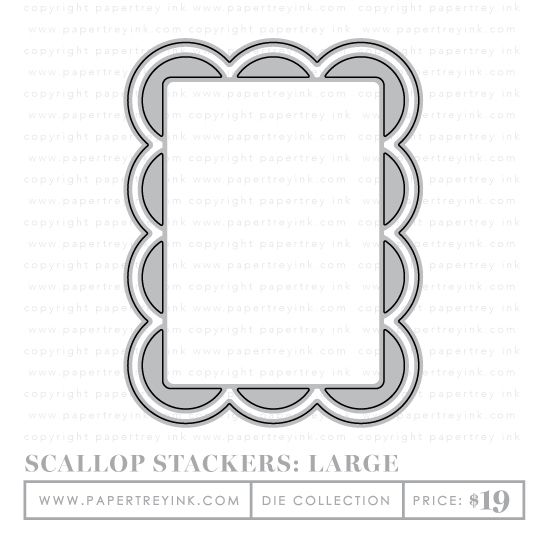 Each of the Scallop Stackers die collections contains two dies that you can use independent of each other or you can stack them up, to have a separate color or pattern layer behind your top, scalloped layer! Their large size makes them perfect for use as a mat layer on your card front. 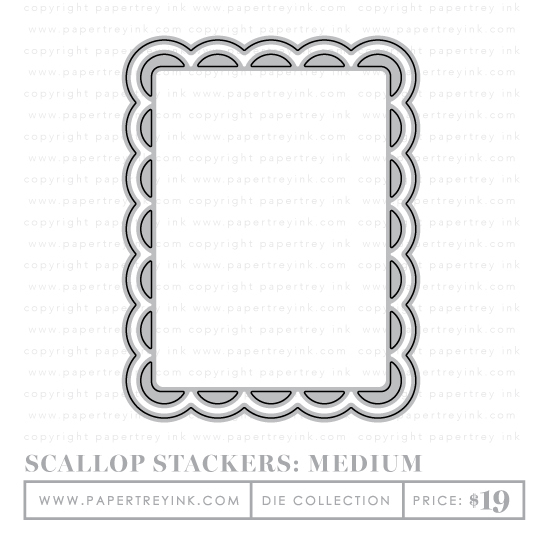 Stamp directly on them or pile up your embellishments on these fun, scalloped layers for lots of design impact! We are happy to introduce a new color collection in our Bitty Big patterned paper line. These collections are offered in single color packages, with a few new colors being introduced each month. Each package contains 3 patterns: stripes, dots, and gingham. The three patterns are printed double sided, with one side featuring a small version of the pattern and the other side featuring large scale. So you get two options for your designs with less sheets to invest in! Each collection includes 24 sheets (8 sheets of each double-sided pattern). Each sheet features the bitty version of the pattern on one side, and the reverse features the big version. Printed on smooth 8-1/2″ x 11″ text weight paper. The collection will be available in Berry Sorbet on July 15th.